The House of Stewart, Fish Fry Saturdays @ Mt Ester A.M.E Zion Church and Auburn A.M.E Zion Church, The Yella’ Store and The Chicken Coop. And if you are from my hometown you know exactly the who, where and what I am talking about. Not to forget this post would not be complete without the mention of my new local fave Mr. Shark’s. Oh My Goodness! Talk about total YUM factor. Okay now I got my mouth watering. LOL. So when I’m feeling nostalgic and craving a taste of back home. Or I can’t visit my local fave seafood spot I just whip out the ole’ cookbook and in the words of my daddy, I get ta “switchin’ in the kitchen”. 6-8 fish fillets, such as haddock, tilapia, cod, etc. If fish is frozen, let them thaw. If fish is fresh, clean, wash and dry the fish. Pre-Heat canola oil on med to med-high heat. Mix together the milk and seasoning in a small shallow dish. Dip the fish in the milk mixture. Mixture together the flour and corn meal. Roll fish in the flour/corn meal mixture. 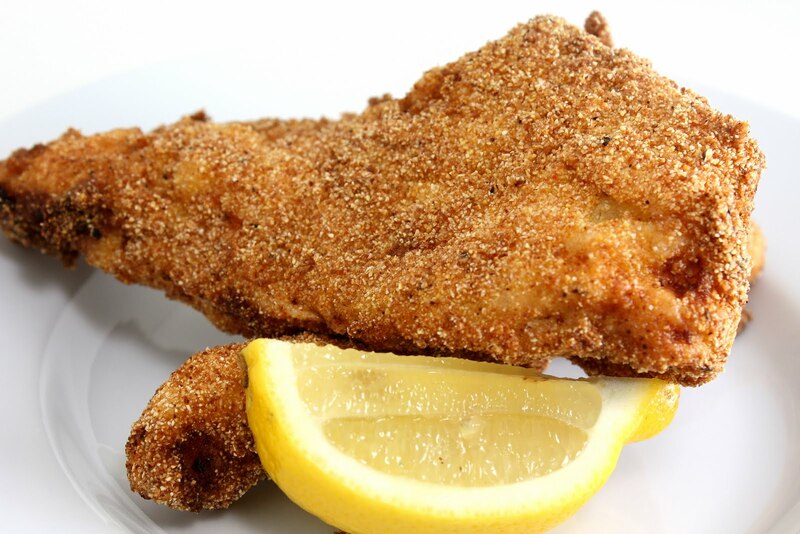 Fry the fish in the hot canola oil for 4-5 minutes or until brown. Turn fish carefully. Fry 4-5 minutes more or until fish is brown and cooked. Put fish on a paper towel or brown paper bag to soak up the excess oil. Lightly season fish fillets to taste & drizzle each piece of fish with lemon juice. Serve Hot & Fresh out the grease. Enjoy! *Chef’s Tip: Not quite sure if the fish is done? Try testing the fish with a fork. The fish will be fully cooked when it falls apart easily.